The theodolite is an instrument designed for measuring angles. 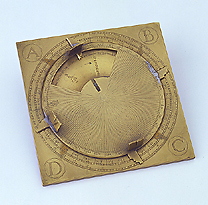 The instrument is made up of a square brass plate, the corners of which bear the letters 'A', 'B', 'C', 'D'. On the square there is a rotating disk with four sights and four pointers, one of which is missing. A window is engraved into the disk which displays the wind rose. The same type of theodolite is also found in an instrument attributed to the Flemish maker Gualterus Arsenius (Epact 28680).